Pressured on how meetings should be like when presenting something? Fret not because the key is not through hi-tech presentations but through good communication skills presented by you and your concept map. To become an effective presenter, you have to prepare well for your business meeting for it to become successful. For a very important meeting, one must take care of different strategies in order to let people understand the agenda. Meetings like these require that you set a fixed objective in order to solicit the participation of the members of the table who will be the judge of your work. For effective meeting management mind mapping software are not less than a miracle. Software map can effectively introduce your ideas to different people inside and outside your organization and manage a room of facility details. With its powerful ability to share information towards other onlookers, software maps can organize and gather numerous pieces of conveyed information. Nobody in the room would like a disorganized presentation because it will broaden the nonsense discussion of things that you have deliberately said but had no meaning. How should you utilize your mapping software as a prototype for the next meeting? Determine the people who will attend your meeting. Who are the people who should be there? Who are the people who are involved in adding input for the needed project? Who are the decision-makers that need to add more comments about your map? Do you need consultants or other people outside the organization that can greatly contribute to your outline’s success? If all your answers are all positive, then you can start jotting down the different people inside and outside your Org. Know the pertinent info about them. Define objectives. Without objectives, your plan will be chaotic. You have to polish certain objectives in order to aim at something at every end of a meeting. What should be the purpose of your meeting? What are your goals and future accomplishments? How should the outcome of your project look? Place every sound objective that you can think of in a separate branch or section of your map. Know your facility or equipment needs. Branch out the facility needs of your organization. This should convey the different needs in your meeting. Consider if there are any participants that will use other presentation types like PowerPoint or MindManager for the brainstorming of the group. You can use your mapping software to be able to define different needs visually, support any need for the teleconference, arrangements for lunch and so much more. This is also meant to save time efficiently without thinking of the fuss or delaying the meeting because of insufficiencies. Define the important items on agenda. If you already have an objective, you can now drive your members to create agenda for your meeting. List the topics that are needed to be discussed and who should lead the discussion for a particular segment. Place the different agendas in a separate branch of your map. Be sure that the people whom you have placed in that position are effective enough to do the discussion. Their equipment needed must also be consistent with the manner of how they are presenting their outlines. 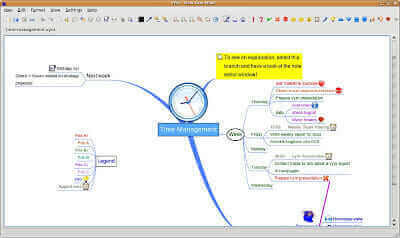 By using the mind mapping software, you can organize and structure almost all your business meetings. Mind mapping is a great tool to be able to streamline your business workflow and keep myriad of data in a well-organized form.